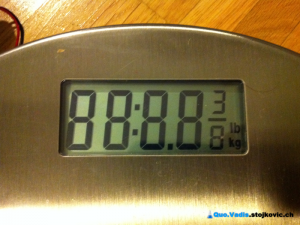 Hacking a weighing scale – Quo Vadis ? Last couple of weekends I mainly spent at home. This was ideal opportunity to do some home maintenance (cleaning 🙁 ). Somewhere under the bed I found a weighing scale that my wife and I occasionally use. 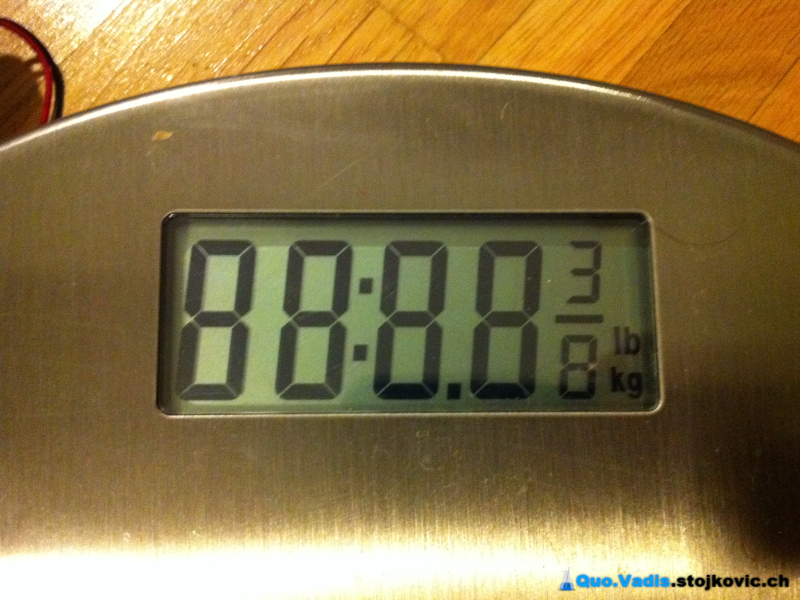 This is the simple digital weighing scale from Ikea – GRUNDTAL. During last months I stumbled upon couple of articles about automatic weight logging, so the outcome was obvious: the next home project – wireless logging weighing scale. Luckily I already had necessary tools and parts, so the next couple of days were fun. 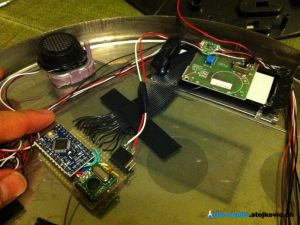 The idea was to connect the scale to Arduino Pro Mini, decode the readings from the scale, and send the weight wirelessly, using RFM12B radio module from HopeRF, to the central Homy system. There, the weight with the timestamp would be persisted into the database and published to Facebook wall. 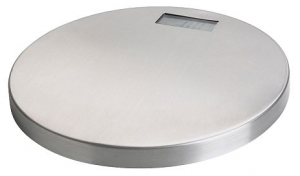 The excellent starting point was project SdCardBathroomScale. Other useful resources were Hacking a digital bathroom scale, Digital Scale Strain Gauge Weight Sensor, … I decided to use the simplest and the fastest approach – hooking to LCD signals, and decoding data sent to the display. Opening the scale was really simple; there are four screws to be unscrewed to access the inside of the scale. Then, six more screws to access the main circuit board of the scale. The nice surprise was that there were testing points for every pin going to LCD. I used these to solder “spy” cable. In addition to these, I soldered two more wires, one for GND and one for 5V, that would be used to power Arduino. After that I put the board back and fixed it with six screws. With that I finished hardware hacking part. Nice thing was that there was enough space left in the scale to put additional stuff like Arduino and wireless module. 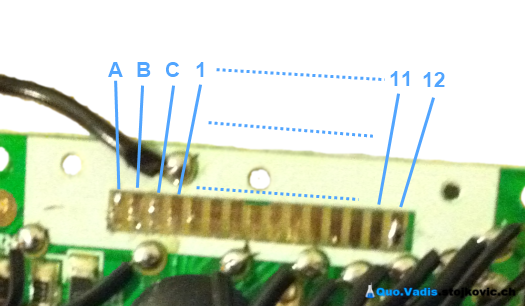 One important thing about the spy cable is to solder the wires in the same order as pins on the LCD; this will make things much easier later (I mixed up two wires, and was receiving some “crazy” numbers 🙁 ) On the picture below, I marked the pins on the LCD as A, B, C, 1, 2, …, 12. The second step was to figure out how to decode the signals coming to LCD. Big help in understanding how this LCD works was a document describing LCD driver for Z8 Encore!. After some probing, I came to the diagram that represents how LCD works in this scale and maps specific LED segment to the coresponding pin. All the segments on the LCD are divided in 3 planes: A (green), B (yellow) and C (red) and 12 groups: 1, 2, …, 12. All these (planes and groups) are mapped to specific pins, and by reading signal values, it would be possible to decode the value displayed on the scale using some simple acquisition algorithm and one multiple-output boolean function. The third step was to connect the Arduino to the LCD and to connect the wireless module to the Arduino. After some soldering and testing all the connections, everything was ready for the next step. 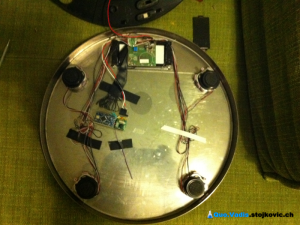 The forth step was developing the program that will run on the Arduino. 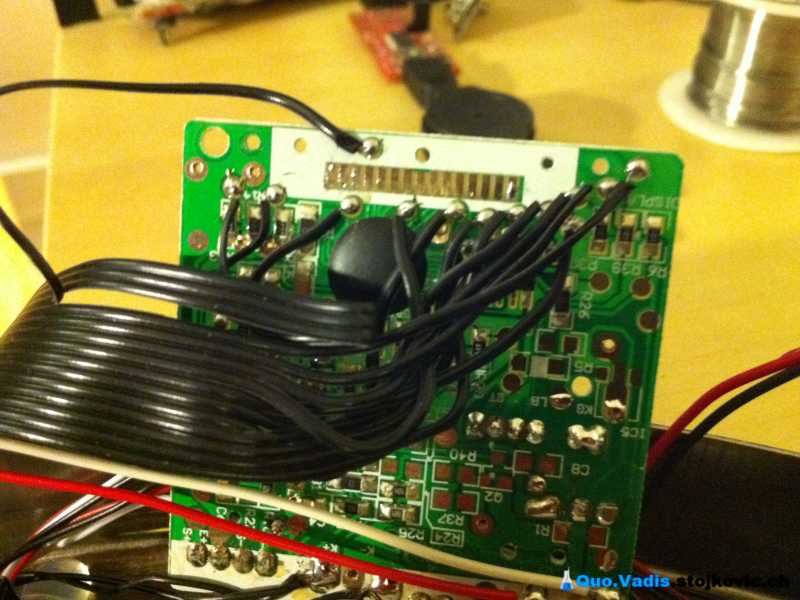 There were two important parts: decoding the LCD signals and optimizing the power consumption. For the decoding part a combination of statistical methods and boolean function was used in order to have accurate readout of the display. For the power consumption part, interrupts and low power states were used. Minimizing the power consumption was necessary in order to maximize the life of 9V battery that was used to power the scale. I managed to go down with the consumption to 100μA. The last step was to collect the weight sent from the wireless enabled scale to the central Homy system. This information is persisted in database and posted to Facebook wall. This will not be described in this post, since it is similar to Facebook integration I have described in one of the previous posts. © 2011 – 2012, Quo Vadis ?. All rights reserved. I was trying to do what you did in this article, but not the weight scale, is a pH meter (like this one: https://www.allaboutcircuits.com/news/teardown-tuesday-digital-ph-meter/). But the problem is, when I connect the wire to the arduino, my pH meter will going crazy, the value is pretty unstable. Looks like some noise effect it, I tried to put the resistor and diode between pH meter and arduino, but it’s not working. I was wondering, if you could give me some advise? Thanks a lot. That is one nice idea that you have there. My best guess would be to use common ground; keep in mind electronics is not my stronger side. Sorry to bother you, and thanks for that advise. I adapted this for a Soehnle (German product) scale. Had a few things to solve with slightly different encoding but it works like a charm now and transmits my weight + timestamp to a cpp-listener running on my RpI 2 via 2.4 GHz. Thanks a all thumbs up! Could you post the encodings for the Soehnle scale? is it possible you can scrub all the wireless+streaming+extras out of your sketch so i can try to learn the basic lcd decoding part? The wireless and streaming part is really minimal. Remove all rf12* commands and include of JeeLib.h. If you want to remove Streaming library, you would need to change every Serial command from serial < < to Serial.print. The rest of the code is not that arduino specific, just basic C++ stuff. I wish you success with you project. Looks like you are on good path. Just keep on and share the results. thanx for the quick reply… it’s just my eyes just glaze over when i try to get a grasp on ur code.. Thanks very much for writing this up. It was very helpful in developing my own smart scales. I used a Particle Core which has a few nice features such as built-in wifi and some sleep modes. I adapted your code as my scale was a little different to yours, I also changed the method for triggering when to log and added in some timeouts. i have Digital orque adaptor.i just opened it i found their is Black-dot,their is LCD display which is having 16 pins. now i want to transfer this LCd displayed data to 8051 microcontroller. i want to know how can i do that? i dont have detailed description of LCD which is mounted on that. i am thinking to use cables and decode each signal from LCD pins and process it to microcontroller. but i dont have oscilloscope inorder to read at each pins of LCD . i dont know which pins of lCd signifies what..? Can anyone help me out any alternate way by which i can decode the data from 16 pins of lCD and send to microcontroller? I am also working same kind of project. i want to know how did u decode each signal from LCD of weighing scale. can u tell me how did u decode each signal from LCD pins? and how did u come to conclusion that respective pins are generating A,B and C.
I have connected the pins to Arduino analog inputs and printed the sampled values to console. After that, I just imported all of that into excel, made some graphs. Similar result would be if you used oscilloscope, which I didn’t have at that point. Then it is just a little bit of logic, and trial and error in order to understand how really coding works. Thank you for instructions. I made my own wifi scale with your help. I have a Sencor scale with same LCD. I used arduino pro mini too, but my code send the data over a secondary serial port to an ESP8266 board. The ESP connect directly to a router, and when connected, store weight to my MySql server with a PHP script. The LCD readings not correct every time, but 99% it reads good values. hey can u tell me how did u interface “spy”cable with arduino? Did you know the Jeenode board ? It is an arduino compatible board with RFM12B integrated. Hi. I`m trying to follow this project but im having trouble getting a stable analogRead. -my LCD has 4 backplanes. im receiving around 0,215,430,645. -i already mapped the LCD by turning the segments on and off with digitalWrite. How can I translate this analogReads? whats ON and OFF? how can i get it stable? As you could see in my code, I got 3 levels of signal (0-342, 342-683, 683-1000) that were coded as -1, 0, 1, and then depending on backplane signal (1, -1) encoded into 0 or 1. This might be totally different in your case. I would suggest you experiment with different polarity of backplane signal and different segment voltage levels to figure out coding in your case; I guess this is different with every LCD. Also, datasheet for LCD can help. what is LCD part number? Unfortunately, I cannot see it without fully disassembling the scale. I am thinking on getting my hands on this project too .-). 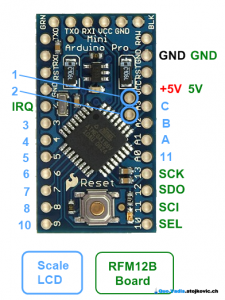 Can you please clarify if the Arduino pinout that you posted is complete? I think that there is no reference to pin number 9 on where it should be connected. Another question I have is that what kind of batteries does your weighting scale use? I ask because you refer two additional wires for 5v supply (for arduino and rfm12b) but in my case, my scale (also Grundtal) only uses two 1,5v AA batteries. Your insights would be very helpful. The pinout is correct. You can see also in code that pins 9 and 12 are not read. This I did on purpose, in order to save some pins since I had only 10 pins free on Arduino. You will be fine without this pin only in case you don’t have 9x kg (digits 3 and 9 will give the same readout), otherwise you would need to include it. My scale has 9V battery, so I didn’t have any problems with power source. Voltage regulator in your case would be an option. First of all, let me thank you for posting such great projects/hacks. Can I ask you what kind of device did you use to turn on/off those ceiling lamps? Did you dismantled the wall sockets you’ve shown in the pictures? Do you consider to allow access to the code of your applications? Once more, thanks for your projects. I guess you meant to send comment to another post. There I already answered. The whole pinout diagram is in the picture “Arduino pinout” in the post. It is really simple. The sketch is for the Duemilanove as I’m still awaiting for a Mini Pro to arrive. Feel free to delete my previous posts as they’ll probably just confuse other visitors! Is it necessary some ci or resistor in some pin? The sketch work in Arduino UNO? Do you think you can help me out on this? But why is the result getting splitted? This already looks much better… Did you get any stable value afterall? Maybe if the averaged bits were calculated for only the last 10 or 100 values in array instead of the full array it would be more precise, but I cant figure out how to do that.. I have made a small sketch (http://troels.leegaard.org/misc/unit.pde) which verifies the pin arrangement by checking backplane A and lcdpin 9 when outputting KG/LB/ST (can be changed on the back of the scale). In this case the backplanes are connected to analog inputs on the Arduino and lcdpin9 to a digital input. The backplane is low and the lcdpin high when the KG symbol is lid. BTW.. The values on the analog inputs (lcdA..lcdD) are 0, ~200, ~400 and ~600. So it must be something similar to http://casainho-projects.googlecode.com/svn/trunk/sdcard_bathroom_scale/images/bathroom_scale-jata_hogar_490/jata_hogar_490-oscilloscope-20091005-10.jpg (the yellow trace). – input from plane pins was 0, ~500, ~1000; which was encoded into -1, 0 and 1 in my case (pa, pb, pc). Did you and Vince ever solve the hacking of the 20047 model? I think I got the first part covered, but I have problems decoding the output.. I didn’t manage to follow Vince any further in his investigation. Maybe he can give some input here, in case he follows this discussion by any chance. Hey, I’m are doing a similar kind of project. I have been trying to understand your code, but have some problems with it..
What is your project about? Feel free to drop any question. One part of the code (one handling decoding of LCD) is specific. Depending on LCD display this part needs to be changed (like in Vince’s case). I figured out the decoding part of the code, and I think your code would work for our display. We are still getting 0 weight, but we’ll keep debugging the code. We did make the program to print the values of ABC and first four segments, and we saw the backplanes go on and the required segments at the same time. Im not fully understand the part of the code with the if’s after decoding the 1,0,-1.
the part with the SA[n],SB[n],SC[n]. The part with SA, SB, SC is all about trying to find the most common/frequent state of the segments from the moment LCD is turned on. Finding arithmetic median value gives correct weight in 99% of the cases. This is all because weight on LCD goes from 0 to target weight, and there is some flickering as well. dis you get an idea since I have put the last results ? Maybe you didn’t have time…I understand. Now I have to understand how I can decode it, according to the lcd display map I drew http://www.arpege-studio.com/Grundtal/ and the Jata_Hogar_490 scale project. I already feel the headache arrived! If with these new elements, you have an idea to propose me. lcdX can take value 0 to 1024. Your if statement looks really strange. What is the weight you put on scale? What do you get in the console if you print out values for lcdA – lcdD, lcd1 – lcd9 in while loop? Thanks for your quick answer Dusan. You’re right, bad copy/paste in my previous message for the lcdX, if statement. 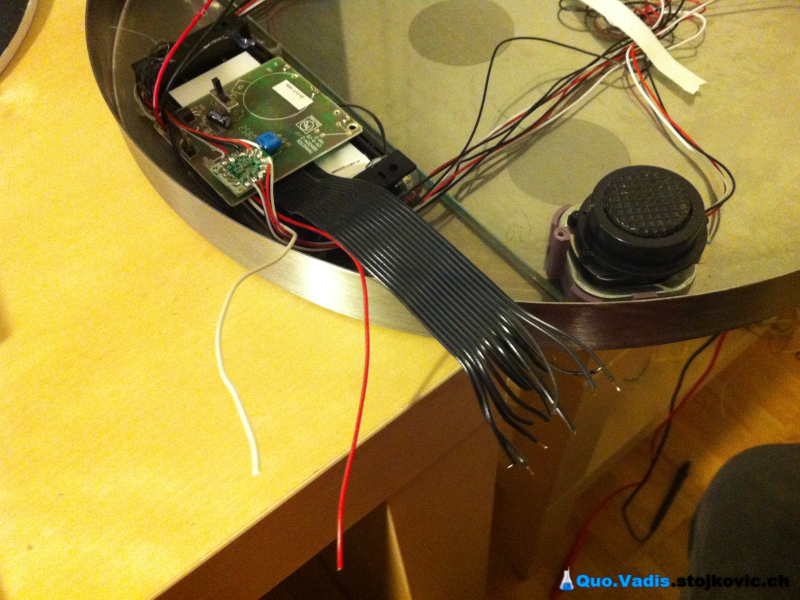 4) lcd2 seems not to be conected, check the wire! Repeats but I thank you again! In our case we have a 13 pin LCD, instead of the 15 pin shown above in your experiment. In this case, do we assign 3 pins for A,B,C, 1 for ground and the remaining 9 for the lcd displays? In this case it would mean we have three hex digits right? or is it possible to drive 4 lcd digits too? Are you using same scale (Grundtal)? In any case the LCD must be driven in a different way. No way I can tell what is the correct way to control the LCD in that case. I am afraid you need to figure it out by “playing” with LCD (as I did as well). Feel free to share your success once you have it figured out. First of all, thanks for your tutorial Dusan ! In fact I have the same problem that you. My scale is the Grundtal from IKEA but unfortunately I have only 13 pins on it. When the scale is On, I measure 1.44V between each lcd pins and GND. Don’t know if it’s usefull to know that. Sending skipped. Weight is below threshold value! From what you have described, it looks like either wiring or code is not working with your version of LCD. It is hard to say how that 13 pin display works. Try to find its serial number and some datasheet for it. Otherwise you would need to figure it out yourself. I found really good info on LCD decoding in http://code.google.com/p/casainho-projects/wiki/SdCardBathroomScale . Signals lcdA, lcdB and lcdC are backplane signals, and these guys are sync signals for the rest of the signals (lcd1-lcd?). You can not just measure DC voltage between 2 pins, you will not get usable value, and anyway the relevant voltage should be between backplane pin (lcdA, lcdB or lcdC) and segment pin (lcd1-lcd?). I suggest you guys use different approach, use 3V DC and apply it to lcdA (or lcdB, or lcdC) and other pins (lcd1-lcd?). 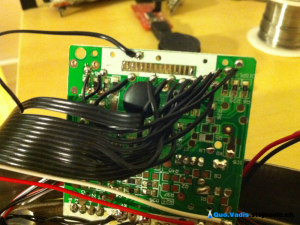 In that way you would be able to figure out which pins are backplane and which are the segment pins. This is how I figured out what is each pin for. Despite the code samples available, I fail to fit my case. I hope you can help me and that software’s part is a breeze for you! Basically, additional variables for backplane signal D are added and getDigit function is adopted. In case of bad values, investigate about encoding/decoding 7 segment display; this could help about getDigit function. I have found another link that explain how to hack a weighing scale and this Jata Hogar scale got the same LCD (I’ve checked the 13 pins with my scope) than the new one they put in the Grundtal N° 20047. But the project isn’t written for the Arduino…too bad for me ! From what I can remmember, waveforms were more like for Scale Fagor BB-90. Algorithm in my code handles decoding that kind of waveforms. I suggest you deep little in the code and compare it with the one for your display. Let me know how it went. Scale serial is 20325, it lookes exactly like in that picture. great job, I am working on something similar, just using SI labs RF Dev kit. I tried your bathroom scale code for Arduino, but it doesn’t compile, I think it got somehow mangled when converted for web. Would you care to post the original source code somewhere? Just now I see that code is mangled. I have updated the code, please try now; it should compile. Make sure you get latest libraries from http://jeelabs.net/projects/cafe/repository. I wish you success in your project. Let us know the results; your approach seems interesting. Ah should’ve looked around a little more closely on your blog before asking. This Homy thing is AWESOME! Great work, and thank you so much for sharing!! Quick question on this. What were you communicating with wirelessly outside of the scale? I assume the radio described can’t connect to a wifi network, so did you just build another arduino module with another RFM12B transmitter on it and hook that up to your computer for the Facebook posting part? Really cool project! I started researching this exact thing yesterday and I’m excited to build my own!